Monarch 1110 Labels, White "SELL BY"
Monarch 1110 Labels, White/Blue "GROCERY"
Monarch 1110 Labels, Yellow/Red "SALE PRICE"
Monarch Labels come in many sizes and colors. Labels are easy to identify the price guns that it will fit. For example, a Monarch Label 1135 label will be used for Monarch 1135 Price gun. 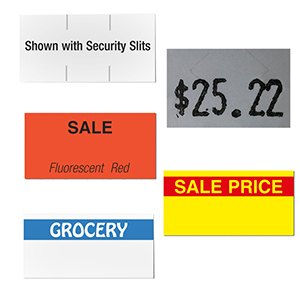 American Retail Supply offers fluorescent red, fluorescent green, white, yellow, removable and even pre-printed Monarch Labels. The Security slits prevent shoppers from removing your price labels without your knowledge. If they try and remove your labels, they will rip. We recommend using florescent red labels for “on sale items” and the white ones for regular sale prices. Removable adhesive back makes it easier to stick them on items or shelves. American Retail Supply can also customize a Monarch Label. For more information please call 800-426-5708.